Saturday, as well as exploring #8BitLane, I ended up going to the Hollywood Costume exhibition at the Victoria and Albert Museum and the Wildlife Photographer of the Year 2013 exhibition at the Natural History Museum. Unfortunately no photography was allowed in either exhibit, so I thought I’d post a few of my favourite parts from each. 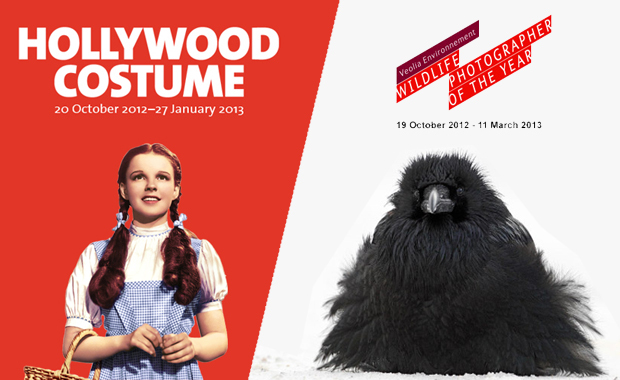 First up, the Hollywood Costume exhibit. When I first saw it advertised, I was adamant that I HAD to see this as I am a huge film buff and get stupidly excited about seeing real film props. The exhibition has brought together over 100 collections from films between 1912-2012, many of which have never been publicly displayed before. There even was an insightful section on CGI character design, looking at Avatar and John Carter. Each room focussed on a specific part of the theoretical design process of costume design. The most notable exhibits for me were Batman (Dark Knight Rises), Catwoman (Batman Returns), The Bride (Kill Bill), Neo (The Matrix) and Ming the Merciless (Flash Gordon). There were also the Spiderman costume, Indiana Jones (Raiders of the Lost Ark), Dorothy (The Wizard of OZ) and Captain Jack Sparrow (Pirates of the Caribbean). Obviously there were way more, but these were the ones that I enjoyed seeing the most! Absolutely stunning images and I’ve now got the buzz to go out and start snapping again!